Does anyone know a 25 year old college student, not on a trust fund, that does not need money? Here’s a kid who goes to an NBA game in Oklahoma City to see the Thunder… his favorite team. He’s sitting in the bleachers when half-time rolls around and gets picked out at random to be one of five fans who will get a shot at winning twenty grand by making a shot from half-court. 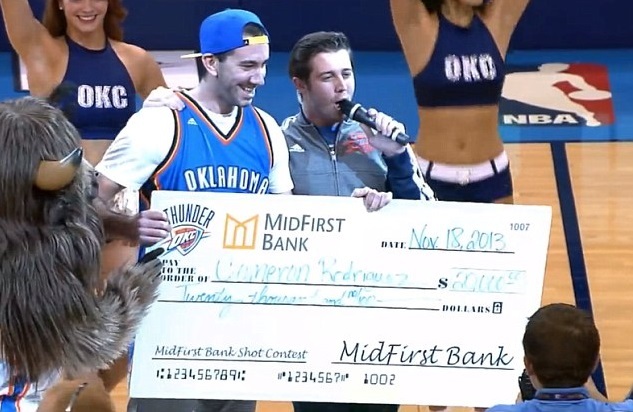 Cameron Rodriguez made the shot and won the money in the form of a huge check presented to him by representatives of the Thunder organization and several pretty girls. It was quite a show and the replays of the shot and the ceremony afterwards can be seen all over the Internet. But now they are saying that Rodriquez’s eligibility to play with the Southwestern College Moundbuilders, an NAIA school in Winfield, Kansas, where he is on a four dime a year basketball scholarship at a school where the annual costs run up to around $33,000. Pray tell, what difference does a lucky halftime shot at a pro game have to do with a players ability to continue playing college basketball? Worse yet, now they are even threatening not to give him the money which amounts to more than his entire 4 year scholarship with the Moundbuilders! Who has the right to make that decision and how did he or she garner such a power? The prize was offered by the Oklahoma City organization in an effort to increase attendance at home games for the Thunder. Ironically, the fact that Mr. Rodriguez was chosen at random from the fans in the stands seems to have no bearing on the case at all. Why not? There is a rule in the NAIA student guide that states that athletes can’t use their (God Given) sports abilities or fame for financial reward. The case is now under review by the NAIA Eligibility folks and Executive Director John Leavens told the press that rulings on these cases typically take one to two weeks. Just how many cases like this roll around during the course of the season? So give the kid the money already!